The 2006 meet was a great success. Look below for more info on the 2007 meet. CLICK HERE FOR PHOTOS OF THE 2006 EVENT. CLICK HERE FOR PHOTOS FROM THE 2005 EVENT. 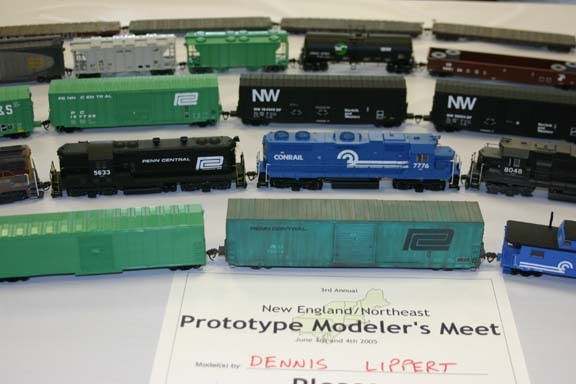 The 2007 New England/Northeast Prototype Modelers Meet is coming up fast. We’ve been working to line up a great array of clinics, vendors and manufacturers. Tour of Branchline Trains on May 31st and layout open houses on June 3rd. For information, contact neprotomeet@gmail.com or Dave Owens at 860-233-0303. If you are interested in doing a clinic or slide show, let us know. The meet costs $25 in advance and $30 at the door. To register, send a check payable to NE Proto Meet to Fran Richard, 34 Ellsworth Road, West Hartford, CT 06107. More than two days of clinics, model displays, layout tours, prototype presentations and camaraderie intended to teach you a few new modeling techniques and to get you excited about doing some great model railroading. The most important part of any prototype meet is the model display. All models in all stages of completion are welcome and encouraged. And there are no contests, so don’t be concerned you’ll be held to some imaginary standard. Please bring models. The ever-evolving list of speakers includes: Tony Koester, Matt Snell, Mike Rose, Ted Culotta, Tom Murray, Bill Schaumburg, Marty McGuirk, George Barrett, Preston Cook, Dave Messer, Neil Gage, Tom Nanos, Rob Pisani, Neil Schofield, Rick Abramson, Scott Mason, Bill Schneider, Ralph Heiss, Vincent Lee, Jim Homoki, Jeff Hanke and many more. Clinic topics will include, among other things, Conrail’s Office Car Special, maintenance of way vehicles, rail/marine operations around New York City, the Boston & Albany’s Highland Branch, scratch building, Amtrak modeling, structure modeling, military vehicles, photographing your models and layout, what’s inside F-units, and prototype operating practices. Vendors and manufacturers attending so far include: Bob’s Photo, Speedwitch Media, Sheepscot Scale Models, Atlas Model Railroad Co., Bethlehem Car Works, Branchline Trains, Funaro & Camerlengo, Mike Rose Hobbies, The Hobby Gallery, Hobby Shop of Collinsville. A schedule for the meet will not be available until a week or so ahead of the meet. We’re not trying to be difficult. It’s just hard to set a schedule in stone far in advance. Thanks for your patience and understanding. We hope to have a website up and running by the time of the meet. Note: Often times the hotels and motels offer deals on their websites that are not offered to people who call. It might be worth checking websites. Some of these listed below, such as the first two, do not have websites. Hillside Motel, 671 Route 44 (Albany Turnpike), Collinsville, CT, 860-693-4951, about three miles from the meet site. Alcove Motel, Route 44, New Hartford, 860-693-8577, about four miles from the meet site. Marriott Residence Inn, 55 Simsbury Road, Avon, CT., 860-678-1666, $159 for a studio room. About 5 miles from the meet site. Avon Old Farms Hotel, 279 Avon Mountain Road, Avon, CT, 860-677-1651, $149 for a room with a queen sized bed. About 6 miles from meet site. Day’s Inn, 395 Winsted Road, Torrington, CT. Rooms are $69.99 a night. (860) 496-8808. Motel is 12 miles (25 minutes) from the meet site. Super 8 Motel, 492 East Main St., Torrington, CT. (860) 496-0811. Rooms are $99 a night or $89.10 with a AAA discount. Motel is 12 miles (22 minutes) from the meet site. Marriott – Farmington, 15 Farm Springs Road, Farmington, CT. (860) 678-1000. Rooms are currently going for $99 a night. About 13 miles (25 minutes) from the meet site. Holiday Inn Express, 120 Laning Street, Southington, CT, 860-276-0736. Rates are $88 to $109. About 17 miles (31 minutes) from the meet site. Ramada Inn – Plainville, 400 New Britain Avenue, Plainville, CT, 860-747-6876. About 14 miles (28 minutes) from the meet site. Studios Plus Farmington, 1 Batterson Park Road, Farmington, CT. About 13 miles (25 minutes) from the meet site. Howard Johnson Express, 462 Queen Street, Southington, CT, 860-621-0181. Rates are $56.21 for a room with a queen size bed or $59.96 for a room with two double beds. About 17 miles (30 minutes) from the meet site. This motel is just off I-84.